Two all-beef patties, special sauce, lettuce, cheese, pickles, onions, on a sesame seed bun. I remember that McDonald’s commercial like it was yesterday. 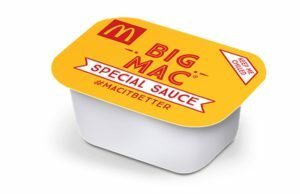 Now, decades later, I’m still fascinated with ‘special sauce’, just not the sauce on a Big Mac. The topic is universal. What makes companies and groups successful? Innovation encompasses special sauce. Some companies find it by creating a new paradigm like Cirque de Soleil. They created a new mold for a circus by removing animals and focusing on adults with a more sophisticated form of entertainment. Chic-fil-a uses customer experience and community involvement for their special sauce to make a chicken sandwich more than just lunch. Innovation isn’t limited to technology. The special sauces from Cirque de Soleil and Chic-fil-a have staying power. While competitors can see it, they haven’t really been able to imitate it. I found the Big Mac special sauce recipe online. Keep searching for your special sauce.